Or is it an old, black, imported, big, leather, long, beautiful, sectional sofa? Or maybe a long, big, . . . ? In American English we often find a bunch of adjectives strung together. Few other languages have this questionable habit, so it’s no wonder that non-native speakers are confused about what adjective goes where. Are there rules? Well, sort of. The following chart from Education First shows what is generally accepted as proper adjective order. Woodward English and Ginger show slightly different categories, but the order is the same. A fun, adjective-order exercise for your more advanced students is to have a stack of cards: one with a noun and the others with appropriate adjectives. Turn the noun card face up and have each of your students draw a card from the others, which are face down, and place it in its correct position next to the noun. Although it’s not likely that your students will have an occasion to use so many adjectives, this game does help demonstrate the purpose of an adjective — to describe a noun. And the physical activity of placing the cards reinforces the concept of adjective order. Do you have a method of teaching adjective order? Please share it with your fellow tutors by leaving a comment. Thank you! 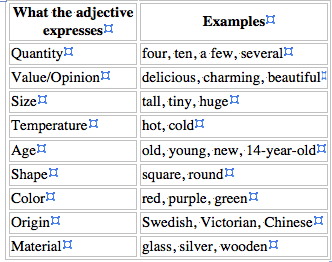 To foster creativity, have them describe an object with as many adjectives as are reasonable. This could lead to a guessing game. Example: A useful thin hard yellow thing used in the classroom. A large gray African animal. A valuable small circular silver Mexican object. Erika, that’s a super idea! I like it better than the cards. It sounds like more fun, and it would be more meaningful using objects in the classroom. Thank you!